President Recep Tayyip Erdoğan on Wednesday met with Iranian Foreign Minister Javad Zarif, who arrived in Ankara to brief him on his meeting with Syria Bashar Assad. Erdoğan received Zarif at the presidential complex where they had a closed-door meeting lasting over an hour. 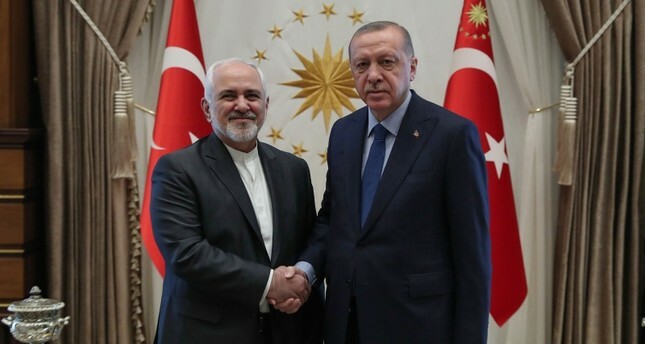 Zarif said earlier Wednesday in a joint news conference following bilateral talks with his Turkish counterpart Mevlüt Çavuşoğlu that he would submit a report to President Erdoğan about his "long meeting" with Assad. "I had a long meeting with Bashar Assad. I will be giving details of these discussions to Mr. Erdogan," he said. Turkey supports the moderate Syrian opposition and Iran backs Assad in Syria's long war, but the two sides have been expanding contacts amid international efforts to end the fighting. Kazakhstan will host a fresh round of talks on Syria on April 25-26 in its capital, recently renamed from Astana to Nur-Sultan. "In Syria, from the start, on the ground, we do not agree with Iran on many issues," Foreign Minister Çavuşoğlu said on Wednesday. "But we have decided to cooperate with Iran for a political solution." Zarif also said Iran acknowledges Turkey's concerns about the PKK-linked People's Protection Units (YPG) in Syria. "We understand the concerns of Turkey about terrorist groups in Syria and we agree with them. The security and peace of the Turkish people are very important to us. We enjoy very thorough cooperation on this issue," Zarif said. Repeated rounds of U.N.-backed Syria peace talks have failed to end the bloodshed, and Turkey, Iran and Russia have sponsored the parallel Astana negotiations since early 2017. Talks among the three countries have focused on the terrorist-held bastion of Idlib in northwestern Syria, local Syrian media have reported. That region, which borders Turkey, is mostly held by Syria's former al-Qaida affiliate, Hayat Tahrir al-Sham (HTS), and is in theory protected from a massive Syrian regime offensive by a deal made by Turkey and Russia in September to set up a buffer zone. However, the Assad regime and Iran-backed groups have continued to attack the Idlib de-escalation zone, killing 135 civilians in March alone, according to the Syrian Network for Human Rights (SNHR). Çavuşoğlu said Wednesday that Turkey would continue to explain to the U.S. that sanctions targeting Iran are wrong. "Our ministers expressed Turkey's concerns to U.S. counterparts in a recent meeting," Çavuşoğlu said, in reference to Treasury and Finance Minister Berat Albayrak and Trade Minister Ruhsar Pekcan's visit to Washington, where they met with top U.S. officials, including President Donald Trump. "Then, trust in the global system will suffer and there could be total chaos," he added, urging caution. In an unprecedented move, U.S. President Donald Trump on April 8 said he would formally designate the force a "terrorist organization."